Has The Ideal Biocarrier Finally Been Developed? In order to improve the efficiency of biofilm technologies, a high-performance biocarrier has been developed, based on requests for ideal carrier characteristics. Attached growth based wastewater treatment processes, commonly known as MBBR or IFAS, has been now well proven for their distinct advantages over suspended growth based solutions. The heart of processes is the tiny biocarriers on which biofilm grows and contribute to the treatment of the wastewater. Over the years, numerous types of materials, shapes, and configurations have been developed for the biocarriers and still the technology is evolving around developing an ideal biocarrier which makes the fixed film or attached growth process more and more attractive to wastewater treatment fraternity. So, finally, do we have an ideal biocarrier for MBBR/IFAS processes? An ideal biocarrier should have following properties so that it can be utilized effectively as carrier material for the development of biofilm on it. Optimized material properties enabling easy fluidization. Dr. Imre Pascik, a German scientist having polymer chemistry background and vast experience in complex effluent treatment, has been trying to develop an ideal carrier since his time at Bayer AG, Germany. LEVAPOR, a synthetically-modified carrier developed by Dr. Pascik, is a composite comprising of a polymeric foam matrix and a coating of fine adsorbent pigments. 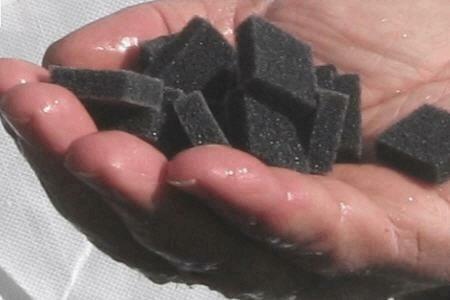 The highly-porous elastic foam shows significant advantages over “classic“ plastic carriers applied in water reuse. In contrast to standard plastic biomedia with moderate surface of 500 to 1000 m²/m³, LEVAPOR features a surface in the range of 1,3 to 1,6 106 m²/m³, enabling the adsorption of toxic pollutants and very fast colonization, supported by microbial affinity and the water-binding capacity of the carrier. A test with chlorobenzoate-degrading bacteria has shown that the colonization of the carrier surface was almost completed within 180 minutes. Fast colonization of the carrier surface and subsequent biofilm generation offers numerous benefit. 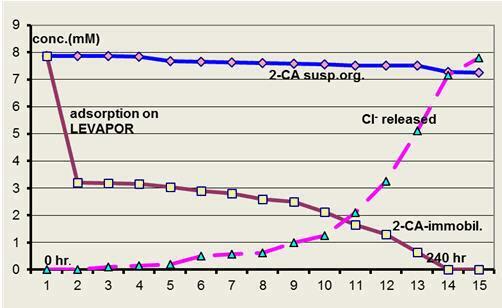 In a test for degradation 2-chloranilin (2-CA), after adsorption of the toxic pollutants on LEVAPOR Carriers, the toxicity of the medium reduced drastically allowing the degradation of 2CA causing its mineralization or hydrolysis. It also quantitatively mineralized the adsorbed 2CA regenerating the adsorbing capacity. 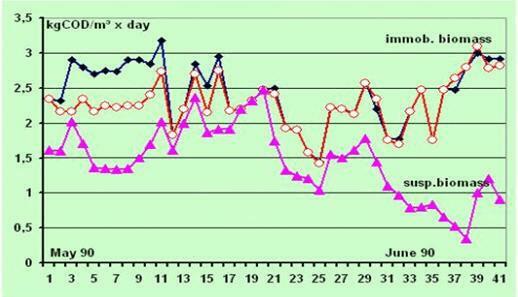 This phenomenon has been confirmed by the quantity of chloride ions released in the medium (Fig. 2). This mechanism of adsorption-mineralization-regeneration is very much important for the adaptation of microbial communities for the biodegradation of persistent and/or hazardous pollutants which otherwise seriously hamper the growth of required micro organisms making the biodegradation of such effluent very difficult. During the starting phase of a multistep, full-scale plant treating toxic pulp mill effluents, two of the three methanogenic reactors had been filled with LEVAPOR, while the third one was started with suspended granular sludge. Just after the start, both biofilm reactors achieved higher performances than the third one. A change in the mode of production and subsequent toxic shock load crashed the performance of suspended bacteria completely, while the biofilm reactors recovered their capacity quite fast (Fig. 3). Microbial cells fixed in a biofilm show between 100 to 300 percent higher performance than the same cells in suspended form. In continuous pilot scale tests for the anaerobic treatment of toxic pulp mill effluent containing up to 100 mg/L AOX (Fig. 4), at a vol. loading rate of LV = 3,0 g COD/L*d, the biofilm reactor removed ca. 300 percent more COD than the suspended cell reactor; for the full-scale plant design only 18,000 m³ LEVAPOR based anaerobic reactors were used which otherwise required 65,000 m³ of suspended growth based reactor. 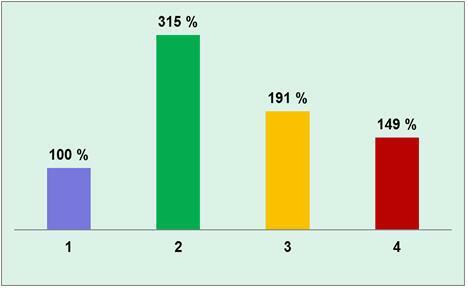 Field tests for carrier selection for nitrifying bacteria in a fish hatchery with water reuse showed that LEVAPOR-supported cells resulted in the highest reactor performance for nitrification of NH4N and NO2N to NO3N, as well as NH4N < 0,2 mg/L and NO2N < 0,1 mg/L (Fig. 5). 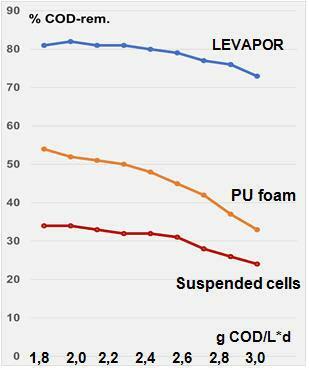 Due to their unique properties, bioreactors filled with only 12 to 15 vol.% LEVAPOR achieved their optimal performance, compared with reactors filled with 40 to 60 percent plastic carriers. Shape, density, and dimensions of the LEVAPOR biocarrier (20x20x7 mm) have been adapted to the requirement of optimal application, enabling easy energy-saving fluidization by aeration density in the range of 5 to 6 m³/m²*h, compared with 10 to 11 m³/m²*h for plastic carriers. Technology level (for existing plants). Due to higher biomass density per m3 of media and also associated higher biochemical oxidation rates, usually the wastewater treatment plant footprints with LEVAPOR technology reduces 30 to 50 percent compared to conventional technologies. This offers huge savings in terms of civil construction cost and land requirement and its acquisition costs. Furthermore, due to lower reactor filling (12 to 15 percent of total reactor volume) and light weight, hydrophilic material of carriers, the fluidization energy requires for LEVAPOR carriers is around 5-6 Nm³/m².hr compared to 8-10 Nm³/m².hr air requirement with conventional plastic media which offers remarkable energy saving for a plant having wide load fluctuations. Certainly the benefits of implementing LEVAPOR for toxic and inhibitory substance containing effluents for COD removal and nitrification are very unique and specific due to specific carrier properties like presence of activated carbon, high adsorption capacity, higher surface area and inner porosity along with the most important attribute of “reversible adsorption” which makes biodegradation of toxic substance containing effluent much easier compared to suspended growth process and other plastic media based attached growth processes.